Mary Ellen's Cooking Creations: Happy Hour!! Is it really Memorial Day weekend already? I don't know where the time goes anymore. I wish everyone a great weekend to kick off your summer. And don't forget to thank a Vet! To kick off our weekend, we had a few friends over for drinks. I was so excited to have the opportunity to try a few new appetizers. I made chicken skewers with a cilantro cream dipping sauce and tortilla pinwheels. Jon is the master of marinades and he created a new one for the chicken. He's so creative with combining different flavors - things I wouldn't even think of. I'm not sure how much of each item he used, but it was enough for 3 pounds of boneless chicken breast strips. 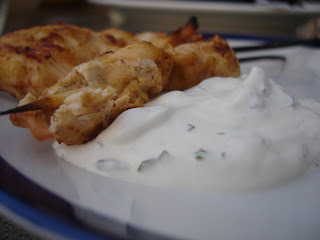 For the dipping sauce, I combined about 2 hand fulls of fresh chopped cilantro with 1 container of sour cream. Easy, refreshing, and the perfect dipping sauce to balance out the heat and spice of the chicken. 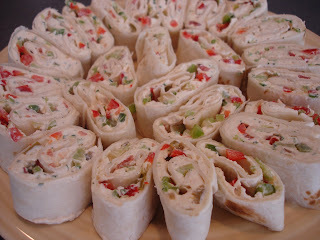 Tortilla Pinwheels - these were also really easy and looked very festive. I took 2 packages of softened cream cheese and mixed them with 1 package of dry ranch dressing mix and about 2 tablespoons of salsa. I spread a thin layer of the mixture onto a tortilla shell, topped it with some tiny pieces of chopped red pepper, green pepper, and celery. Roll it up and refrigerate overnight. I was able to make 6 tortillas with these ingredients. Just before serving, I sliced them into 1 inch pieces. How pretty are they? They tasted great too. I think for a winter appetizer I'd make these with rolled out crescent rolls and bake. Yum. I also made a signature drink. Well, sort of. 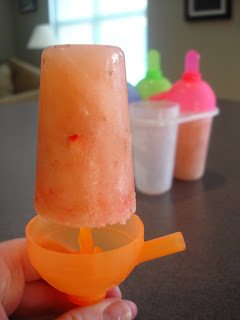 Strawberry Daiquiri Popsicles!! - 1/4 cup rum (I used a little more) ** Use tequila if you want strawberry margarita pops. You'll also need 8 ice-pop molds. To prep your popsicle, put one piece of strawberry on the end of each popsicle stick. Then blend all ingredients, except the leftover strawberries, until the sugar is dissolved. Add the strawberries and blend. Pour the drink into the molds and freeze overnight. You end up with a sweet adult popsicle with a drunken strawberry surprise in the middle. You could get really drunk on too many of these! Now we're headed to Atlantic City for the night. Hope everyone has a good one! Awesome spread! I'm a sucker for anything with cilantro in it but I can't make tortilla pinwheels - I end up eating *way* too many of the "scraps" while I'm cutting them. They look great, though! Yum, that all looks wonderful! Great job. I bet your happy hour was a hit! Looks like a great spread! I make some pinwheels that are similar to those. They are great!